So I'm working on this massive Colorado song database (cataloging every single song, on every single piece of vinyl I own), when I get to the letter "C" and find this long-forgotten LP in my collection, from The Coachmen. There is a $10 label on the plain back cover, so I'm thinking I obtained it from a used record store, somewhere in my travels. I remember liking the yellowing, pasted-on front cover picture, so I took a chance, and plopped down my Hamilton. So I get home and, like I always do when I obtain a perplexing find, I head to the Internet to look for additional information. Much to my surprise, I discover the album has had realized online auction prices of well-over $100 (!! ), AND I also discover that this record might be from a Colorado group! After searching a few hours, for definitive proof that these guys were actually a Colorado band, and finding none, I filed it away - only to be rediscovered in my stash, today. 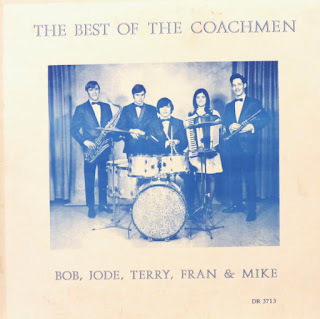 The front cover only mentions the band members: Bob, Jode, Terry, Fran and Mike. There is absolutely no mention of a city, a state, or a recording studio. The album was issued on the Director Records label and is an RCA Custom pressing. Apparently, around this same time, there was another band, going by The Coachmen, based in Nebraska. There were also Coachmen bands in Bellinghman, WA; St. Louis MO; Iowa, Mountainside, New Jersey, and Sacramento, CA. The pre-ZZ Top group the Moving Sidewalks were originally dubbed The Coachmen, and an Illinois group, dubbed The Coachmen, which included a young Dan Fogelberg. Plus, there was a group going by Cindy Rella and the Coachmen, who had a minor hit with "Bring Me a Beatle for Christmas" - and that's just naming a few! To make matters even more confusing, there was apparently a three-piece band, from Colorado, going by The Coachmen. Newspaper archive digging find them playing quite a bit in Colorado Springs, Greeley, and Boulder, from 1966-1969. So dear reader, let's figure this one out. I'm looking for absolute proof that the five-piece Coachmen, with Bob, Jode, Terry, Fran and Mike, are from Colorado, or not.